▶ "I 'm pondering over how could I play my dearest movies in MP4 format on DVD player?" ▶ "My DVD burner only supports VOB format, which is really a headache as it is unable to recognize a home movie that I made a few days ago. I really need to burn the MP4 movie into a DVD as a present for my sister's birthday. Can anyone help me?" ▶ "I've tried several converters on my Mac to change my MP4 videos to VOB so as to play on my DVD player, but output quality really gets me disappointed. Is there any program for my Mac that delivers excellent image?" To be frank, whether you want to play these MP4 files on DVD player or burn them to a DVD on your Mac OS, the most shortcut method is to decode MP4 video and encode it to DVD compatible VOB format because VOB is the core format in DVD discs, which is supported by the mainstream DVD player. But here, you don't need to be a technical geek. MacX Video Converter Pro clears off your path, helping you convert MP4 to VOB on Mac (macOS Mojave included) perfectly. With amazing features including trimming, cropping, merging, watermarking, etc. you can customize your converted video to satisfy your needs of all-round with the video converter for Mac. What's more, the intuitive interface and built-in High Quality Engine make it dead-easy and up to 36X real time faster to accomplish the process on Mac while holding the optimal video quality. Free download this top MP4 video processing software. Import MP4 source video by clicking "Add File" button. You can also add more than one video files and convert them at one time. Besides, this utility is also skillful at converting among a diverse array of video formats including MP4, MOV, FLV, AVI, WMV, MKV, M2TS, AVCHD, mp3, aac, ac3,, etc, so that you can also transcode vob to mp4, AVI to MP4, mkv to mp4, M2TS to MP4, MP4 to AVI, MP4 to MPG, etc. without any problem. 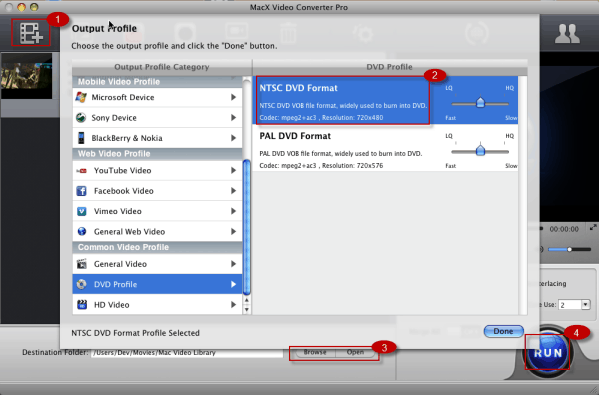 Tips: MacX Video Converter Pro supports merging two or more files at a time. You can simply choose the status Merge All "On" for merge in the main interface. Click the "Browse" button to select a folder where you want to store your output files. Hit the "RUN" button to start MP4 to VOB conversion on Mac.